Beth Mason insists emails alleged stolen out of Mayor Zimmer's City Hall Office and part of the 2011 FBI investigation later found in Lane Bajardi's email account were obtained legally. Last Wednesday night a conversation inadvertently started by First Ward Councilwoman Terry Castellano on an innocuous $200 transcript bill reopened the Pandora's box on the massive theft in the 2010-2011 Data Theft Conspiracy Ring (DTR) of electronic information stolen out of the mayor's office at City Hall. After Councilwoman Castellano inquires on a transcript portion of a bill submitted by Mayor Zimmer in the Bajardi v Pincus civil litigation in her official capacity, it's Councilwoman Beth Mason interjecting a disturbing unfounded claim. During the Bajardi v Pincus trial last month, the court concluded these emails illicitly obtained from Mayor Zimmer's City Hall office were found in Lane Bajardi's email account. The same emails had been turned over among tens of thousands from plaintiffs Lane Bajardi and Kimberly Cardinal Bajardi to defendants in the case last year. Bajardi offered a variety of reasons on the mayor's emails finding their way into his email account before and during the trial. 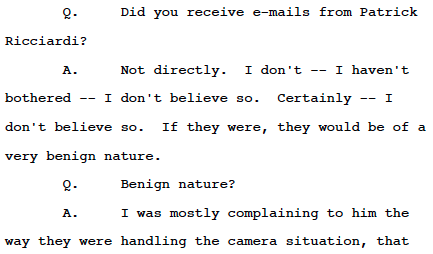 In a deposition last July, Bajardi, in reply to a question from Defense counsel Kerry Flowers if he had received the mayor's stolen emails from Patrick Ricciardi said "not directly" and if he did the emails were "of a very benign nature." He added that he'd never looked at the information sent to him by Perry Klaussen of Hoboken411. The contradictory answers would be supplemented with Bajardi declaring he had never seen them the weekend of February 27th when they were sent with his approval from Hoboken411's Perry Klaussen. At trial, Lane Bajardi would present new alternative testimony claiming the mayor's alleged stolen emails were not on his computer. After an intense 20 minutes of cross examination by defense counsel Stephen Katzman, the court ended the interrogation after Bajardi's counsel admitted the emails were part of the discovery turned over from the plaintiffs to the defense. In the unedited video clip of Wednesday's council meeting below, Beth Mason contradicts the notion the mayor's emails were stolen. Council President Ravi Bhalla in reply, concludes her claim those emails were legally obtained with laughter and replies "No, that's not the case." Beth Mason then falls silent as the Council President references how those emails reached unauthorized persons. Talking Ed Note: MSV investigated all possible legal avenues on the emails allegedly stolen out of Mayor Dawn Zimmmer's Office in February 2011 examining every OPRA request filed in the City Clerk's Office over months last year to determine if any were legally requested and obtained. Related emails (see below) among a batch found their way to a senior Hoboken Fire Department official and then were trafficked to Hoboken411 blog owner Perry Klaussen and routed directly to Beth Mason's intimate political confidante and his political content ghostwriter Lane Bajardi. In the email to Lane Bajardi, Hoboken411's Perry Klaussen bluntly states the emails included are part of denied OPRA requests. 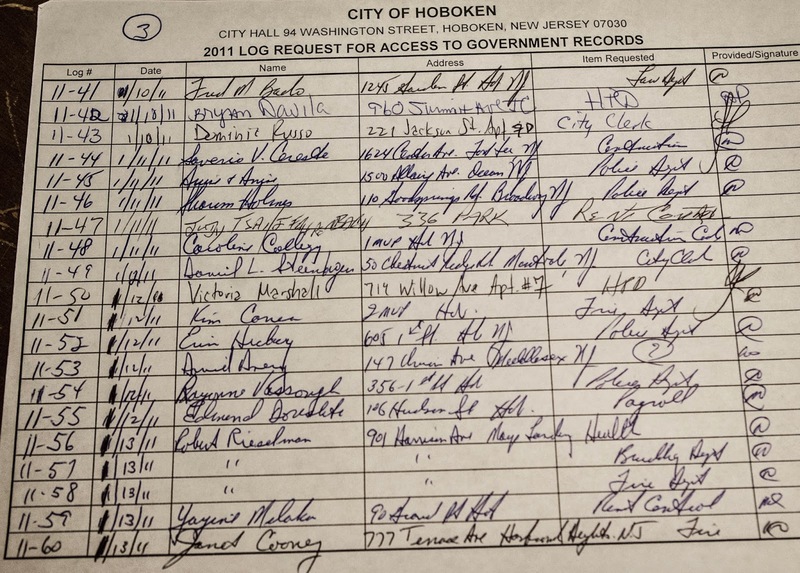 At a minimum, MSV concludes there was NO OPRA request made and approved for confidential emails in the Mayor's office on a Wednesday afternoon, February 23rd, 2011 which found their way to Hoboken411's Perry Klaussen and Lane Bajardi legally several days later that weekend. MSV investigated all OPRA requests from December 2010 through March 2011 and concluded there was not any approved OPRA request(s) for those emails nor is it remotely possible to do so in two business days. If Beth Mason has OPRA evidence to prove otherwise, she should make it available to the public. Beth Mason also declared there's a conflict of interest. Perhaps there is and the US Attorney's Office and FBI should be speaking to her to identify that conflict. The conflict may be of the criminal variety. The following is the complete set of emails presented in a trial exhibit in the Bajardi v Pincus litigation. Stolen Emails Alleged From Mayor Dawn Zimmer's Office at trial: Bajardi v Pincus.